As promised, my report on the closing party and performances of the Scores exhibition at the Lawrimore Project. I had poked around on the Lawrimore Project website as well as the site from the curator, Volume, prior to the show and the score posted above was the one that was leading my list of ones I wanted to perform. I scrambled around Monday morning getting ready (I’ve not been playing out much for the last 6 months or so, so I’d developed a really non-portable studio setup) but was still able to make it to the gallery 45 minutes early. There was only one other performer there at that point so I was able to get my pick of scores. A quick survey revealed to me that my research was correct and that the score that appealed most to both my visual aesthetics as well as having the best musical possibilities was Julie Davidow’s score. Scott Lawrimore, the gallery owner, helped me locate a table and power and then left me to set up. I got myself setup and then spent a bit more time working out an approach to the score. After I’d spent a lot of time looking at it and thinking about it I finally read the card with the title and description. This turned out to be: Evidence of Tudor in a Throusand Plateaus (a mashup in 3 movements). Well this was pretty amazing in my mind that this score was directly inspired by an experience the artist had with a score dedicated to David Tudor. I consider David Tudor a major influence and hero and I feel it’s no coincidence that this was the score which captured my attention. By this time most of the other performers had arrived, selected their score and were setting up. All told there were to be eight performers, most of them solo but there was one duo. Apart from the performers and Scott I’d say there was another dozen people there, a mix of art patrons and music aficionados. 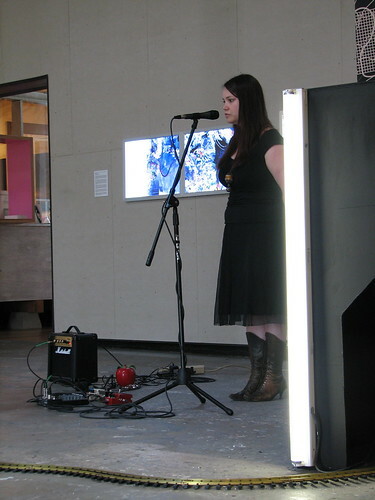 The first performer was Emily Pothast of the band Midday Veil and also of the art focused blog, Translinguistic Other. She was playing a piece by Steven Hull that directly referenced John Cage, including images from Fontana Mix as part of it. This piece was a tall black boxy sculpture with a train that would run through it and then out on the gallery floor. Emily was doing these wordless layered vocal drones that seemed to follow the path of the train and as it would disappear from her view she would stop. This was quite nice and seemed to be a direct attempt to realize the score. A video of Emily’s performance can be found on Vimeo. I should mention that not being familiar with the music of any of the people who performed my main interest was the degree to which they tried to play the score. This performance was followed by the only duo performance, Pearson Wallace-Hoyt and Jon Sargent performing a score that was six pieces of paper about different birds and birdsong. They were playing tapes through effects and later some vocals and guitar work. This was in a sort of crunchy, noisy droney tradition at first which seemed a bit removed from how I recalled the scores. As an aside it should be noted that not many of these scores seemed to be made with music making in mind. They are art pieces with presumably some connection to music in the artists mind, but they are not like a musician attempting to make a piece of music that is best represented graphically. Anyway as their set proceeded they began to add various sequels and squawks of feedback and distressed electronics that I felt could be thought of as a reading of that score. Sort of in the vein of the abstract sounds that Tudor used in his Rainforest to so well capture that environment. 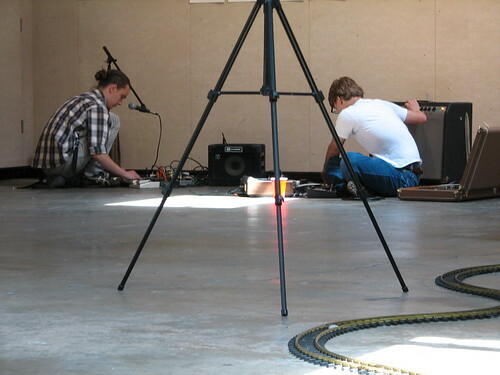 This duo was followed by David Golightly, also of Midday Veil, who did a short solo analog synth performance to a score by Laetitia Sonami that was a Flycatcher complete with flies. 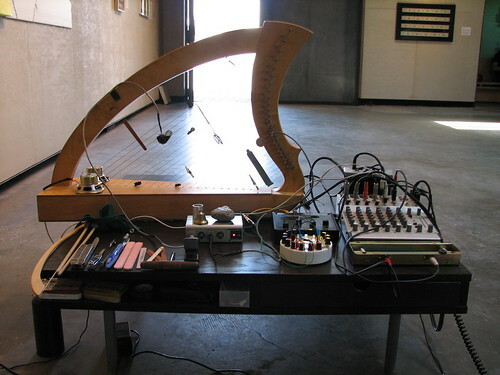 He was using an Octave CAT to created a sputtery layered environment that could evoke with gridwork of the piece with a few events perhaps representing the flies. A nice short little piece that you can watch in it’s entirety on Vimeo. I was up after David and while I can’t really comment on my performance I can say how it went for me. As I sat down I forget to setup a timepiece so I wasn’t really able to judge how I was going. In my experience without using a set time for a graphic score you don’t tend to pace it right. This piece was in three panels with some common elements between them, but also different tones and feels. Its primary element is a wandering webwork that runs through it. Personally I felt I rushed the piece at first giving a bit of short shrift to the first panel. I eased back and did better in the later two, but it was hard to sense how it was progressing. My favorite part of the piece was the last panel with its vast expanses of white space. I interpreted this with a new approach that I’ve been working with where instead of using silence directly I try to create something that would resemble what you experience when there is silence. Following my performance was Wyndel Hunt tackling Fallen Fruit. This piece, which formed such a striking backdrop for the Trimpin film panel a few weeks back, is one of the better pieces of art in the exhibit in my opinion. I can’t see I see it much as a score and based on the process it was created (a group gets together with various jars of jam and jellies and has a “jam session” ha. ha.) I’m not sure how much of that was intended. Wyndel did an interesting interpretation on it that began with a lot of vocal samples, manipulated and distorted and then added rather noisy, perhaps a bit in the Thurston Moore vein, guitar on top of this. Hard to directly relate the voices to the score though a friend suggested that evoked the group process behind it, but the cascading washes of guitar certainly could be read as following the lines of the image. While everything was fairly free form w/r/t the performances Scott had decided on an order for us to play. 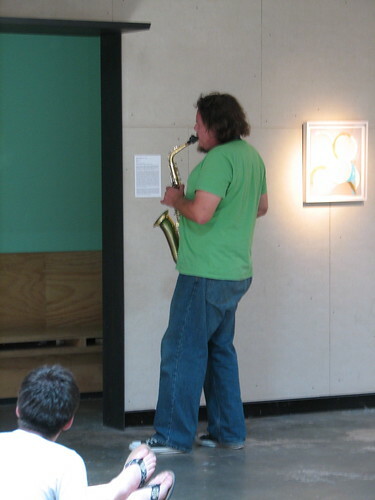 He’d annouced the next performer and the artwork they’d be performing in between each piece. Mixing it up a bit from the arranged orderd, next up was yet another member of Midday Veil, Simon Henneman doing a solo sax take on a video piece by Monique Jenkinson. This video piece seemed about as far from a music score as you could get, but it was a piece that could use a soundtrack, so perhaps if you think of a film as a score for its soundtrack it works that way. It featured images of a woman from the head down, sort of stripping, or dancing or something. It had a very noir-ish feel to it and Henneman responded with a pretty smokey, bluesy sound. Toward the end of the film he strayed into skronkier territory with sheets of wails and some sharper attacks. I felt this all worked quite well as a soundtrack to the film. 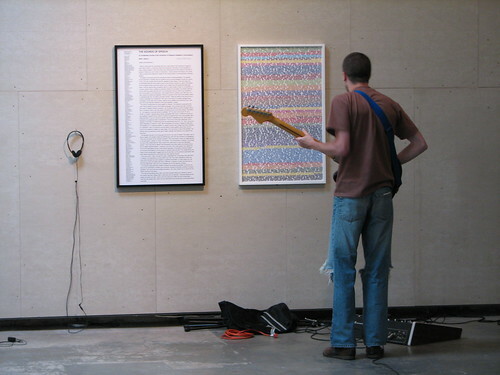 The final performance was Timm Mason who did a solo guitar read of a painting of text by David Schafer. He used the tiniest little practice amp, a little round thing at the end of a chord he tossed away from himself. He appeared to read the entire score and play chords in an angular style as he read. The tiny little amp made this very tinny and distorted it somewhat, but it was a sort of off the cuff, fairly straight chording with perhaps a nod to Derek Bailey. A valid approach to the piece for sure, but it seemed to go on and on. Judge for yourself though, a video has been posted of his performance on Vimeo. After this it was snacks and drinks in the back gallery and Midday Veil did a bit of playing in a side gallery. I mostly packed up and talked to some of the people who I knew from the Eye Music group. All in all it was a pretty good time and certainly an interesting experience. Only afterward did I recall that this was actually the first solo performance I’ve done. Sure I’ve done two one minute solos and I did play solo at the end of the Vancouver New Music Treatise, but this was the first time in this sort of situation. Must have been why I felt so nervous. See all my pictures from this event on my Flickr Page. Find out more about this exhibition at the Scores page on the Lawrimore Project website and at Volume. Video’s from this event on Vimeo.